The source of your musical joy on the Samsung Galaxy tablet is an app aptly named Play Music. You can find that app on the Apps screen. If you don’t see it there directly, look inside the Google folder. You may also find a handy Play Music shortcut right on the main Home screen. You listen to music by locating a song in the Play Music app library. From the Genres, Artists, or Albums categories, choose an item to open and then select a song to listen to. Touching the song title plays the song. While the song plays, you’re free to do anything else on the tablet. 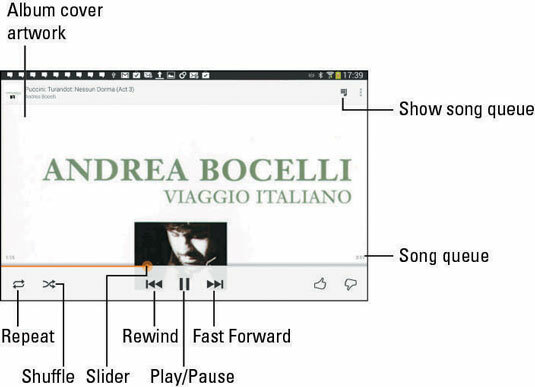 In fact, the song continues to play even when the tablet is locked or goes to sleep. After the song has finished playing, the next song in the list plays. The list order depends on how you start the song. For example, if you start a song from the album view, all songs in that album play in the order listed. The next song in the list doesn’t play if you have the Shuffle button activated. In that case, the Play Music app randomly chooses another song from the same list. Who knows which one will be next? The next song also might not play when you have the Repeat option on: The three Repeat settings, as well as the Shuffle Settings. To change settings, simply touch the Shuffle button or the Repeat button. No Shuffle Songs play one after the other. Shuffle Songs are played in random order. No Repeat Songs don’t repeat. Single Repeat The same song plays over and over. List Repeat All songs in the list play over and over. To stop a song from playing, touch the Pause button. A notification icon appears while music is playing on the Galaxy tablet. To quickly summon the Play Music app and see which song is playing, or to pause the song, touch that notification or pop up the notifications list. You can use the controls in the notification to pause the song or to skip forward or backward. You set the volume by using the Volume key on the side of the tablet. While browsing the Music library, you see the currently playing song at the bottom of the screen. Determining which song plays next depends on how you chose the song that’s playing. If you choose a song by artist, all songs from that artist play, one after the other. When you choose a song by album, that album plays. Choosing a song from the entire song list causes all songs in your Galaxy tablet’s Music library to play. You can arrange the playlist on-the-fly by touching the Show Song Queue icon. Drag the tab at the left end of each item in the list to rearrange the order. After the last song in the list plays, the Play Music app stops playing songs — unless you have the List Repeat option set, in which case the list plays again. You can use the Galaxy tablet’s search capabilities to help locate tunes in your Music library. You can search by artist name, song title, or album. The key is to touch the Search icon when you’re using the Play Music app. Type all or part of the text you’re searching for, and then touch the Search button on the onscreen keyboard. Choose the song you want to hear from the list that’s displayed. Connect it to external speakers. Provide plenty of drinks and snacks. The external speakers can be provided by anything from a custom media dock, a stereo, or the sound system on the Times Square Jumbotron. As long as the device has a standard line input, you’re good. Oh, and you need an audio cable. On one end it needs a mini-headphone jack for the tablet. On the other end it needs an audio jack that matches the output device. Look for such a cable at Radio Shack or any store where the employees wear name tags. After you connect your tablet, start the Play Music app and choose the party playlist you’ve created. If you want the songs to play in random order, touch the Shuffle button. You might also consider choosing the List Repeat command so that all songs in the list repeat. To play all songs saved on your Galaxy tablet, choose the Songs category and touch the first song in the list. Build one playlist for your book club and another one for your theater friends. Enjoy your party, and please drink responsibly.